Sixteen self-aligning, separate tension units, and triple flanged counter hoops plus the new swift action AJAX snare release, makes this drum the most advanced in quality and design on the market today. The Ajax 'Metasonic' is the ultimate in metal shell snare drums and contains all the features of its wooden counterpart. Finished in new Sonic-chrome plating. An 'old favourite' the Ajax comprises all advanced design with outstanding qualities, now synonymous with the word AJAX. Complete with the new Ajax 'A' Tom-Tom legs. 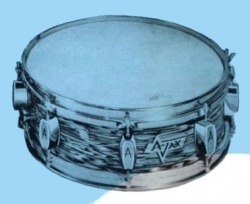 A new addition to the famous AJAX range, the 14" x 14" is rapidly becoming popular with drummers everywhere. An ideal partner to the 12" x 8". Complete with legs. Yet another addition to the Ajax range of Tom-Toms, the 13" x 9" contains all the qualities of Ajax drums, and is an ideal partner for the 16" x 16". Popular with drummers for many years now, the 12" x 8" is a suitable alternative for the 13" x 9". Modern design and straight grain shell construction gives that deep resonant tone required by today's drummers. Self-aligning tension units with T handles and claw hooks give even tension over the entire playing surface.